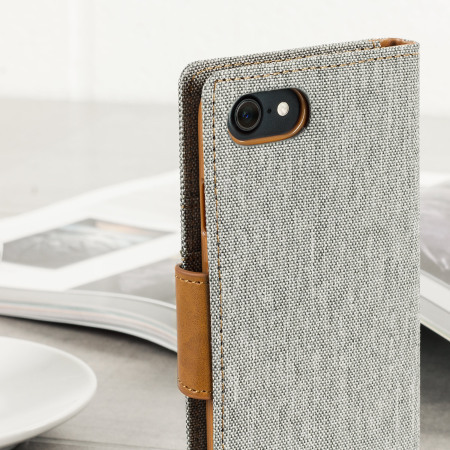 With the perfect blend of lightweight and tough materials, mixed with snappy looks, this grey and camel Mercury Canvas Diary Wallet Case is the ideal companion for your iPhone 7 - Especially when you're out and about. Finally received the case (worth paying extra for quicker delivery, which I didn't). Good design and. Just what you need when out fishing, camping, at the game, dining out, etc when you don't want to carry your full wallet. Absolutely what I wanted phone and cards together in a smart cover. I really like the way it becomes a stand, easy for reading or watching films. Very pleased with item. Well made, good value and gives good all round protection to mobile phone. Camera lens adequately protected by being sufficiently below surface of case. 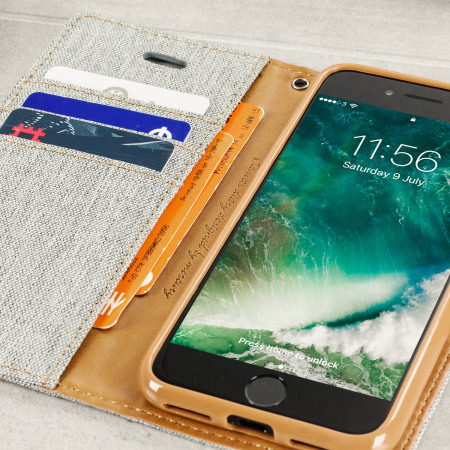 This canvas style travel wallet stand case keeps your iPhone 7 secure and enclosed. 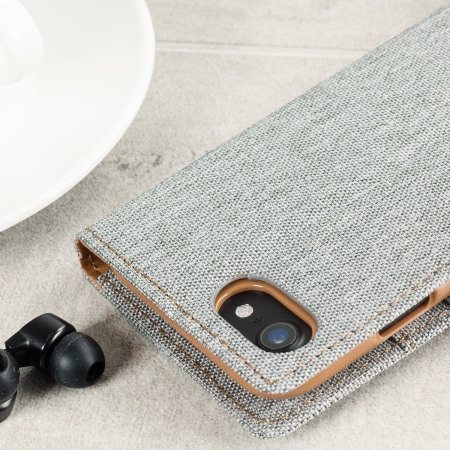 It features an attractive canvas textured hard wearing material that will take all the beating your iPhone might otherwise. 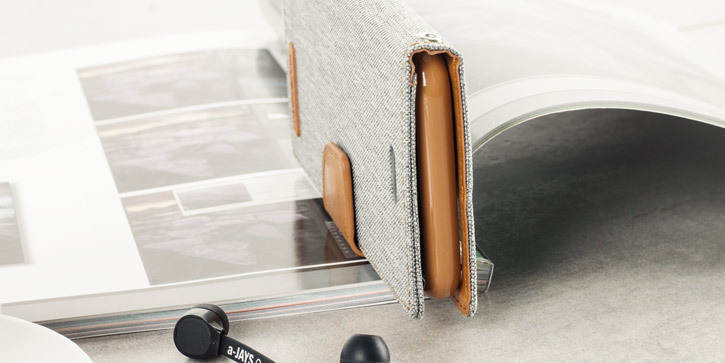 This material is perfect for travel and looks great. The magnetic fastener on the Mercury case will ensure that once closed, your iPhone 7 will stay safely protected within the case and will prevent it from coming loose. Who wants to be carrying around a wallet/purse and a phone case? 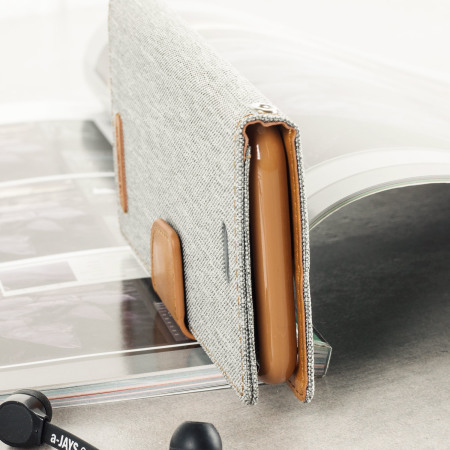 This thoughtful design has it covered with inner pouches specially designed to hold credit cards, store cards, driving licence or anything else of similar size. 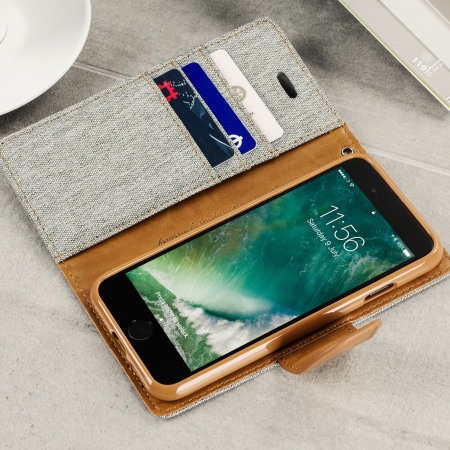 A handy 3 slots for cards are provided with a larger pouch for cash, documents and other items. This makes the case ideal for use when travelling and means your smartphone's screen stays scratch free at the same time. In fact no other wallet case can claim this amount of card space! Watch your favourite content the way you want to. 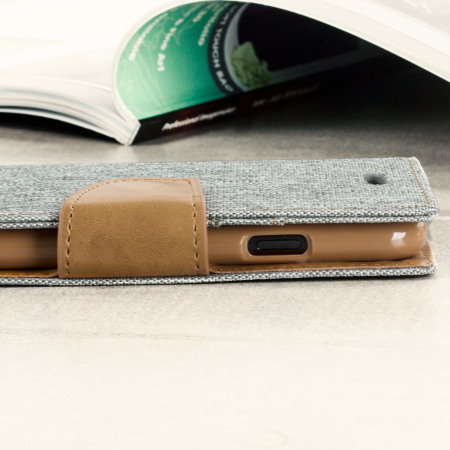 The Mercury Canvas Diary Multi-Function Wallet Case lets you position your iPhone 6 at the angle that suits you best. 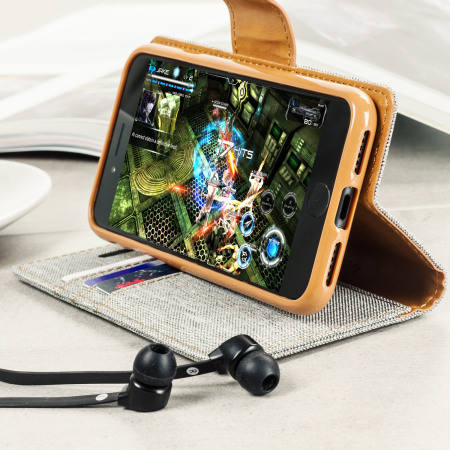 The cleverly designed cover converts into a stand, so you can position your phone at whatever angle is most comfortable for you. 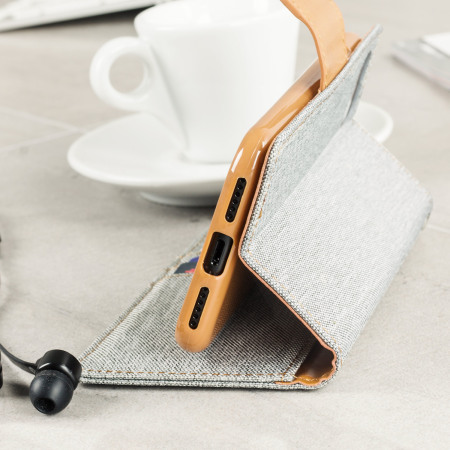 The Mercury Goospery Fancy Wallet case features stitching around the exterior contours of the case, which adds a high quality look as well as sturdy construction. 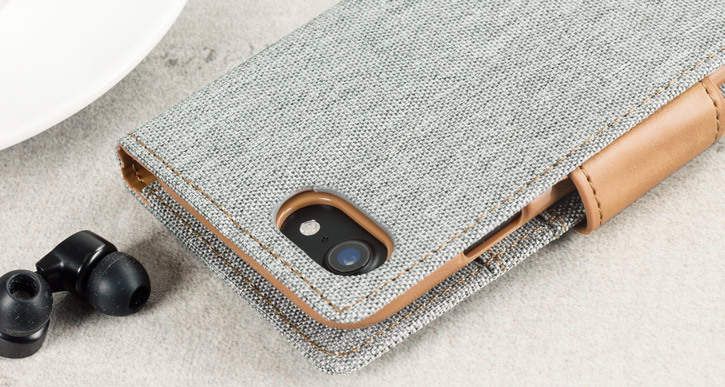 The case has been specially designed for the iPhone 7, so you are giving the best possible fit. 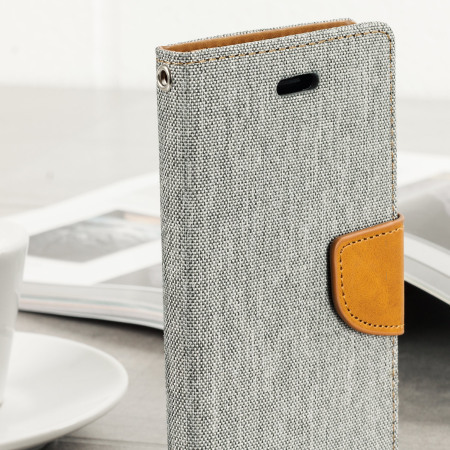 Underneath the sturdy canvas-style casing is a strong plastic frame that will keep your handset safe and protected.